Abstract: For the first time electrical behavior of Jupiter’s Io moon was brought up by Thomas Gold and after him, Perrat and Dessler simulated volcanoes of Io to the “Plasma Gun” that was coordinate with achieved data from the voyager spacecrafts and also effects of Io’s volcanoes and plasma tours was consider. By receiving more data, Wall Thornhill observed specific volcanoes of Io in more details and explained perfectly Io’s Plumes and Lavas. In this article we introduce electrical behavior of Io’s volcanoes and also analysis latest received data from the perspective of an electric model for these volcanoes in Io. It seems predictions and models that planetary sciences geophysicist are offering about this moon are not working properly. Introduction: According to data in the form of photos and videos transmitted from Io moon to the Earth, there are many acting volcanoes in Io that are active for rather long time. Videos and photographs from surface of Jupiter indicate that there is a strong electromagnetic fountain in Io. Analysis on data has given by Voyager probes shows that Io’s volcanoes could be the main factor of appearing these strong electromagnetic and electrostatic fields. [6,7] In fact, the mechanism can be understood like the plasma gun that Output materials from these volcanoes, erupt in the form of plasma and electrical discharge from the output materials is visible, they cause plasma tours around the Jupiter and even sometimes cause some effects on Jupiter’s gasses. Prometheus and Tvashtar volcanoes are the most known active volcanoes in Io. This viewpoint is different from the perspective of geophysicist’s planetary sciences, because they exampled Io’s volcanoes like volcanoes in the earth in the beginnings of their formations, but they have no convincing explanation of the behavior of lava flows or volcanic eruption and their description about destiny of lava currents in Io are not responding properly, but considering electrical model for the Io moon, named events will be more desirable to explain. As Dessler’s attitude that exampled them like electric arcs on Io, an arc cathode discharge is responsible for volcanic eruptions. 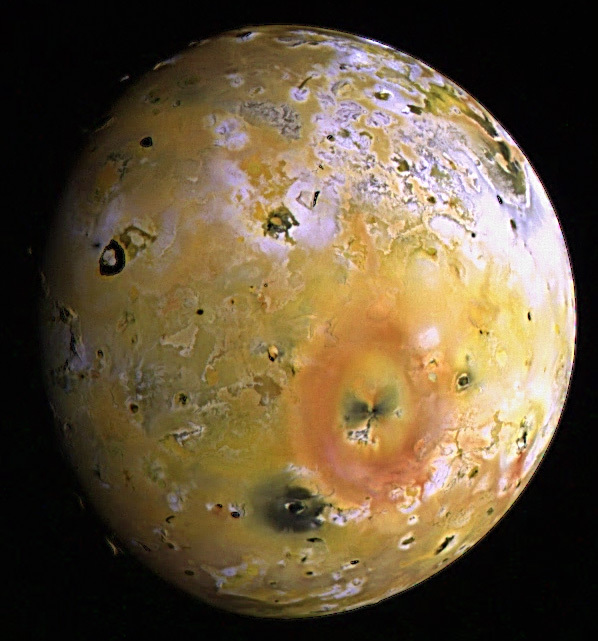 According to latest achieved data of Io, scientists assumed that places of some volcanoes on Io are not correctly right, because the places of these volcanoes are really effective on the Jupiter and formation of plasma tours. So based on this finding, the notion of Io’s volcanoes’ similarities to the earth’s volcanoes is challenging but in spite of these data there is no interference in electrical model of Io. Electric Arcs on the Io: Observations of Io moon indicate that Io has many geophysical motions and also many volcanoes and turbulences in it. Some geologists consider Io like Earth shortly after the moments of its formation, but our analysis of Io volcanoes shows that there is no similarity to volcanoes in earth, because strong Geo-Electric activities are responsible for these volcanic acting and cause eruption of ionic materials from Io’s surface in the form of plasma that also effect on Jupiter. Plasma in Jupiter’s magnetosphere injected from Io plasma tours that flows past Io with a speed of about 57 km/sec. The magnetic field from Jupiter at Io is 1900nT. The v×B voltage included across Io that it’s value is 3630km is therefore 400kV, and A was observed to be flowing out of the Io. It would seem plausible that the current would tend to concentrate in the volcanic plumes, which would give the current easy access to the highly conducting molten interior of Io. It seems that the crust consisting of sulfur and frozen sulfur dioxide, would be relatively poor conductor, thus directing the current to the volcanic vents. If we assume the available power ~0.4 TW is equally divided between the 4 largest volcanic plumes, we have W of continuous power available for each volcanic arc. 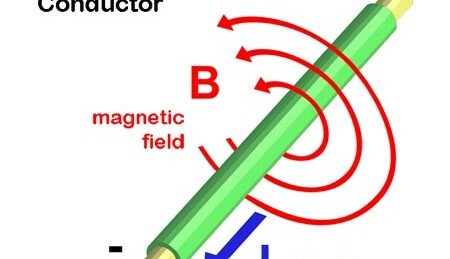 The interaction of magnetospheric particles with the Io and surface causes sputtering and the sputtered ions are picked up by the magnetic field lines and get trapped. Hence, Io’s orbital path is populated with sulfur dioxide which is known as the Io plasma torus. The Io plasma torus is a manifestation of the relation between Io and Jupiter’s magnetosphere. Na, K and Cl are also found in the torus. 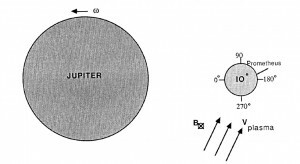 Galileo observations have improved our knowledge about the Io-Jupiter relation considerably. 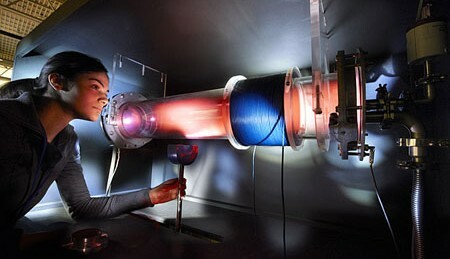 The particles and field instruments detected strongly perturbed fields, beams of energetic electrons and ions, and a dense, cold decelerated plasma flow in Io’s wake From the asymmetries observed by the Galileo plasma wave instrument during the various flybys suggested that the Io’s ionospheric plasma density is being strongly influenced by the magnetospheric plasma flow around Io similar to the radio occultaion experiment observations. Detection of emissions at the Io footprint in Jupiter’s auroral atmosphere in the infrared, ultraviolet, and visible walengths revealed that the particles associated with Io reach Jupiter. The interactions of magnetospheric plasma with Io’s and Jupiter’s atmospheres produce emissions, which are discussed in the next sections. Io’s Plumes: Plume velocities are unexpectedly high and uniform. The plumes are tall, have an umbrella shape, and deposit material in a ring around the source. They also have a filamentary structure. 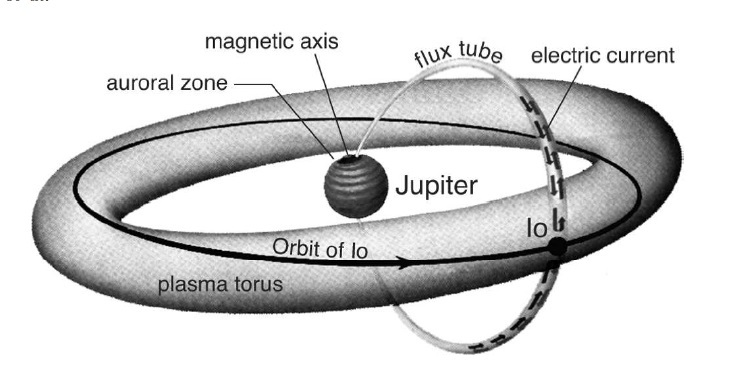 Io orbits inside a donut-shaped cloud of charged particles that come from the material in the plumes, and a tube of electrical current connects Io with Jupiter’s auroras. Arcs accelerate material to fairly high and uniform velocities. This produces uniform trajectories that deposit material a uniform distance from the source, explaining the rings around the volcanoes. And the forces in the discharge channels pinch the arcs into filaments. Repulsive forces between filaments tend to space them equally, often in pairs, around the plumes. The temperatures in the active regions were higher than the spacecraft Galileo’s thermal sensors could measure, far hotter than any volcano on Earth. Yet ridges like Mongibello Mons require a rigid crust to keep them from collapsing. From [12,13,14,15] we suggest that the volcanoes on Io are electrical arcs driven by charge differentials between Io and the plasma sheath that envelopes Jupiter. The discharging was discovered to be focused on the edges of the so-called “lava lakes”, though the rest of these dark fields are comparatively cold. None of the expected volcanic vents could be found. Rather, the plumes of the volcanoes are actually moving across the surface of Io, an exclamation point being provided by the plume of Prometheus which, in the years since Voyager, has moved more than 80 km. Much to the astonishment of mission scientists, it was discovered that the “volcanic” plumes emit ultraviolet light, something inconceivable under normal conditions of volcanic venting. Ultraviolet light is, of course, characteristic of an electric arc. It is why arc welders wear darkened welding masks! It appears that the electrical circuit on Io is concentrating Jupiter’s current flow into several “plasma guns,” or dense plasma foci. 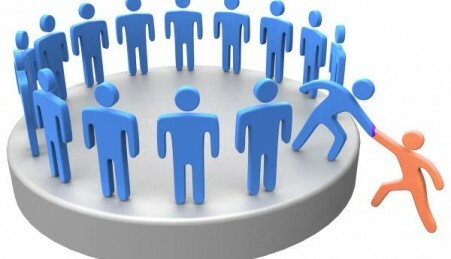 Io is not being heated from within by friction. The most probable cause, based on observational evidence and laboratory analysis, is that Io is receiving an electrical input from Jupiter that is heating it up through electromagnetic induction. Conclusions: According to various given theories about the explanation of Io’s volcanic behaviour and its affection on the Jupiter and formation of plasma tour around the Jupiter there are many unclear points that was described by Thronhill based on Perrat and Dessler ‘s analyses and viewpoints that conclude from Io . Our study on different theories and Thronhill data analyses and also received data by NASA from Io and its volcanoes indicate that Io’s electrical model and similarities between Io’s volcanoes and electric arcs can be right. As a result this volcanoes and its eruptive plasma are main factor for producing plasma tours around the Jupiter and cause affection on surface of Io as well. Finally we conclude that: 1- the vents of the Io’s “volcanic” plumes will be much hotter than lava. ۲- The plumes are the jets of cathode arcs, and they do not explode from a volcanic vent but move around and erode the periphery of dark areas (called “lava lakes” by planetary geologists). 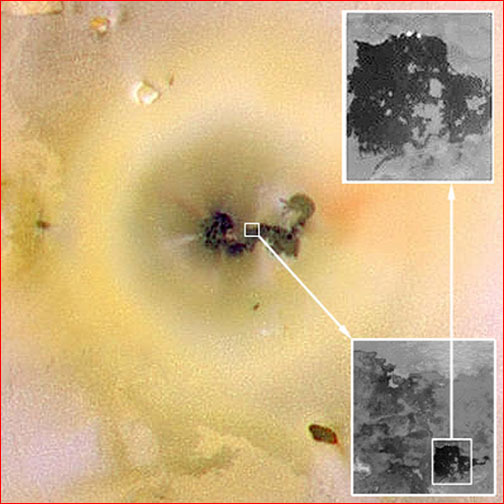 ۳- The “lava lakes” themselves are merely the solid surface of Io etched electrically by cathode arcs and exposed from beneath the sulfur dioxide “snow” deposited by continuous discharge activity. Therefore, they will not reveal the expected heat of a recent lava flow. H. Acuna, F.M. Neubauer, N.F. Ness., Standing Alfven wave current system at Io: Voyager 1 observations, J.Geophys 1981. Bhardwaj, M. Michael. Io-Jupiter System: A Unique Case Of Moon-Planet Interaction. A. Frank.W Paterson., Passage through Io’s ionospheric plasmas by the Galileo spacecraft, J. Geophys.2001. Gold. Electric Origin of the Outburst on Io. Science. 1979. G. Kivelson, K.K. Khurana, C.T Russell, Magnetized or unmagnetized: Ambiguity persists following Galileo’s encounters with Io in 1999 and 2000. J. Geophys. 2001. Peratt, A.J. Dessler. Filamentation of Volcanic Plumes on the Jovian Satellite Io. Astronomy and Astrophysics. 1987. Peratt, Physics of the Plasma Universe. ISBN: 0-387-97575-6. Saur, F.M. Neubauer. Plasma Interaction of Io with Its Plasma Tours. Saur, F.M. Neubauer, D.F. Strobel. M.E. Summers., Three-dimensional plasma simulation of Io’s interaction with the Io plasma torus: Asymmetric plasma flow, J. Geophys 1999. Smith. Electric Io Revisited. Thunderbolts Project. 2007. Smith. 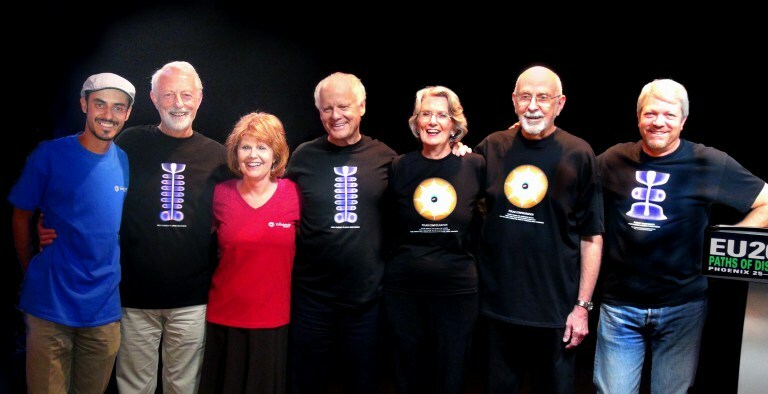 Jupiter’s Consort. Thunderbolts Project. 2010. Thornhill. The Mountains of Io. Thunderbolts Project. 2004. Thornihill. Predicting the Electrical Etching of Io. Thunderbolts Project. 2004. Thornhill. Io’s Plumes. Thunderbolts Project. 2004. Thornhill. Io’s Volcano Prometheus. Thunderbolts Project. 2004.